Situated in Warrington this facility benefits from continuous investment in technology and people and is one of the major factors in ERIKS Sealing Technology's success. The Material Technology Centre's principal activities are to ensure our high quality standards are maintained and to develop new compounds or technical solutions for your applications. Molecules have specific frequencies at which they naturally rotate or vibrate. 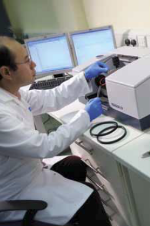 By exposing a material sample to a spectrum of infra-red frequencies the equipment can identify which molecules are present by detecting which frequencies are absorbed. This technique is used to identify the base polymers material type in quality control and to identify thermo-chemical decomposition. TGA is used to identify weight loss of a compound either isothermally over time or over a ramped temperature range. The relative composition of compounds can be identified, to quantify polymer, organic and inorganic filler contents and types. DSC analysis measures changes in enthalpy (exothermic or endothermic energy changes) over time, or, with changes in temperature. DSC analysis can be used as a quality tool (residual cure), an analytical tool (failure analysis), or in development of new materials (glass transition, oxidation etc).